This in-depth, step-by-step tutorial will take you all the way though installing Android 4.1 (Jelly Bean) on your Kindle Fire. Before we get started, there are a few important things to know up front. This will wipe everything from your Kindle Fire. You will be creating a backup but you’ll need to move/copy any files you want to have on your Kindle before you install Android, so that you can put them back on your Kindle afterwards. This process only works on the first generation Kindle Fire. It will not work on the Kindle Fire HD or any of the second generation Kindle Fire devices. You’ll need to be using Windows Vista or higher and be connected to the Internet to use the software required in this tutorial. It’s possible that you will have to revert to a backup if something goes wrong. Make sure to follow the steps carefully (yes, this tutorial shows you how to make a backup). The entire procedure takes less than an hour, but it’s still a good idea to make sure you have at least an hour set aside. Make sure your Kindle Fire is currently unplugged from your PC. Unzip the Kindle_Fire_Utility_v0.9.6.zip file. After unzipping the file, open the Kindle Fire Utility folder. Double-click the install_drivers.bat file. This will launch the Kindle Fire Driver Installer. Click Next to begin the installation. If you’re prompted with a Windows Security Alert, click the Install this driver software anyway button. If another Driver Software Installation window appears, let it do its thing until there’s a “green checkmark” next to each item, and then click the Close button. Now, plug your Kindle Fire into your PC using a USB cable. Return to your Kindle Fire Utility folder, and double-click the run.bat file. This will bring up a Command Prompt window with a list of options. The first thing we want to do here is Install Permanent Root with Superuser. To do so, enter the number 2 (using your keyboard…) and then hit Enter. … you may have to wait for a minute. Your Kindle Fire will reboot/power off and on again. Ignore it. When the Root Installed message appears, tap any key to continue. Now it’s time to Install Latest TWRP Recovery. To do so, enter the number 3 and hit enter. Again, some text will scroll on your screen. When the installation has completed, you’ll see an All Done! message. Your Kindle Fire will reboot/power off and on again. Ignore it. Tap any key to continue. This time we’ll Install Latest FireFireFire by entering the number 5 and hitting enter. You guessed it – your Kindle Fire is going to reboot again. Same as always, tap any key when it’s done. Time for the fun stuff! Enter the number 1 and hit enter. Your Kindle Fire will now be sent a message to start up in Recovery Mode. Leave your Command Prompt window as it is (for now) and pick up that Kindle Fire. Your Kindle Fire will boot up into the TWRP (Team Win Recovery Project) Menu. Tap the Backup button. Make sure that System, Data and Boot are selected. Recovery and Cache are optional. When you’re ready, swipe the Swipe to Back Up “slider”. When it’s done, tap the Back or Home button to return to the Home Menu. This time, tap the Mount button. Tap the Mount USB Storage button. Back on your PC, a new ‘drive’ will appear (very likely named Kindle). Open it, then open the TWRP folder. Drag/Copy the entire BACKUPS folder to your Desktop (or other safe place on your hard drive). Depending on how large your backup files are, this can take a minute or three. Should the need arise, you now have a full backup to recover from if anything goes wrong. For instructions on how to recover your Kindle Fire from these backup files, see the tutorial How to Recover Your Kindle Fire from a TWRP Backup. Once you’ve copied the BACKUPS folder to your PC, you’re going to copy some files over to your Kindle ‘drive’. 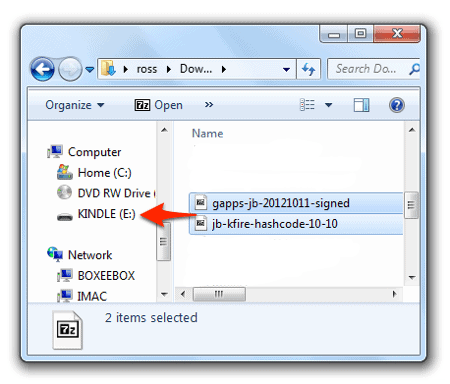 Locate the two files you downloaded way back in step #2 – jb-kfire-hashcode-10-10.zip and gapps-jb-20121011-signed.zip – and drag/copy them to your Kindle. Shouldn’t take too long to copy them. Now right-click on your Kindle drive and select Eject from the menu. You’ll probably see a Safe to Remove Hardware message in Windows. Don’t unplug your Kindle just yet. Back on your Kindle, tap the Unmount button. Now you can unplug your Kindle Fire. Return to the TWRP Home Menu, and this time tap the Wipe button. Tap the Factory Reset button. Now swipe the Swipe to Wipe “slider”. The ‘wiping’ process will now execute. Tap the Back button when it’s done. Heading into the final stretch! Tap the Install button. Tap jb-kfire-hashcode-10-10.zip from the /sdcard menu. Swipe the Swipe to Confirm Flash “slider”. … and when it’s done, tap the Home button. Once again, tap the Install button. This time, select gapps-jb-20121011-signed.zip from the /sdcard menu. Again, swipe away and watch the boring installation. Return to the Home Menu and this time – tap the Reboot button. Your Kindle Fire will now start up, and you’ll have Android 4.1 (Jelly Bean) on your device!!! When you installed/flashed the gapps-jb-20121011-signed.zip file to your Kindle, that installed the “Google Apps” (sort of) on your Kindle Fire. They may not have all (Google Maps, Gmail, etc) installed. The Google Play Store however, will have installed. From within it, you can search for and install all the Google Apps – Gmail, Google Maps, Google Music and so on. 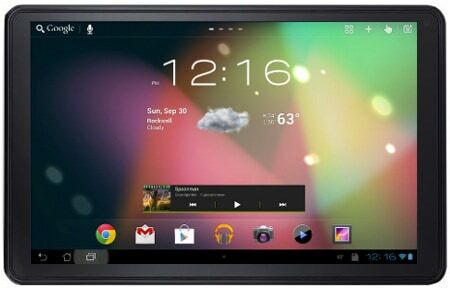 If anything went wrong, or you just don’t like Android 4.1 vs. the Kindle Fire OS, you can use the the tutorial How to Recover Your Kindle Fire from a TWRP Backup to restore your Kindle Fire to its pre-Android 4.1 state.